You can't reinvent the wheel, or the coffee maker. Instead, the Capresso MT900 aims to be a classic coffee maker done well. It sounds like small praise, but how many good coffee makers can you name off-hand? The MT900 hits all the right points—ideal 185º in the cup, wide spray head, insulated carafe, removable water tank, charcoal water filter, automatic-on and classic melitta #4 cone filter. Even better, a reusable goldtone filter and a setting for small batches of coffee double the MT900's utility. 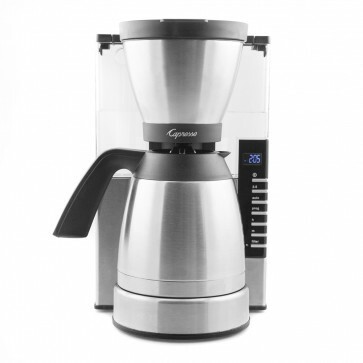 Rapid Brew - The MT900 can brew a full pot of coffee in just under 6 minutes. Pause and Pour - Can't wait? You can have your first cup while the MT900 finishes its brew cycle. Small Batch - A dedicated 3-5 cup brew setting makes it easy to brew for one. Removable Water Tank - The water reservoir features a built-in handle that makes it easy to lift off and fill in the sink. Water Filter - A built-in charcoal water filter helps reduce scale and improve flavor in the pot. Programming - Set the MT900 to brew a pot of coffee so you don't have to. Metal Filter - An included goldtone filter offers a richer cup and can be reused again and again. Insulated Carafe Version - Looking for the glass carafe version? Click here! Just Right - Not too hot and not too cold, the final brew temperature of the Capresso MT900 rivals Bonavita and Technivorm in-cup temperatures. Low Profile - Slim and tall, the MT900 is great looking and will fit in most kitchens. Winning Water - The removable water tank is a no-brainer, and the inclusion of a built-in water filter is a nice addition that will improve your coffee quality without any added work. Pour Problems - The insulated carafe's pour spout is slooooowwwww. We ended up twisting it partially open for faster (and messier) pours at the office. Water Tank in the Back - You'll have to pull the MT900 out from under your cabinet to fill with water. When testing against other drip machines, we found an almost unanimous preference for paper-filtered baskets instead of metal. The MT900 takes the ubiquitous Melitta Cone #4 filter if you prefer it over the included metal. While brew temp is notoriously difficult to test, a rough measurement (a probe thermometer wedged into the brew basket) registered a surprisingly consistent 190 degree brew temperature. Not quite up to the SCAA's standards, but we were more than happy with our results. Preheat your carafe with hot water before brewing! This will keep your coffee piping hot for hours. Clean out brew basket and carafe after every use. Soap out water tank weekly.